Mia Graeffe on Summit of Everest - First Female from Finland to summit Everest from Tibet - Photo Mia Graeffe. Members at ABC during puja. Photo Scott. Please click one of the links below to view that section for the route on Everest Tibet, or scroll down. This expedition to Everest maximizes many years of accumulated wisdom of the high Himalaya, a strong record of reaching the top of 8,000ers: Everest, K2, Kangchenjunga, Lhotse, Makalu, Cho-Oyu, Shishapangma, and many other 8,000 metre summits, in addition to more than 25 Himalayan expeditions, in all safety, along with an intimate knowledge of the Tibetan and Chinese officials who regulate the permit system. We have been running expeditions to Tibet since 1986, and we know all of the bureaucratic officials, liaison officers, yak drivers, and hoteliers/restaurateurs personally. In the morning we continue our bus-ascent into the Tibetan plateau, to the town of Tingri at 4,342 meters/14,200 feet. There are superb views of Shishapangma, Cho-Oyu, and Everest as we drive into Tingri. The town itself is a very basic one-street hamlet surrounded by the tents of nomadic Tibetans. About ½ of all ethnic Tibetans living in Tibet are nomadic or semi-nomadic. Our extremely rustic little hotel has an adequate restaurant, and it will be interesting to see if the high altitude has quelled our appetites for tasty fresh food. There are the ruins of an old fortress on a rise above town, and from here we can see the finest views of Everest, Lhotse, Cho-Oyu, and Shishipangma. We will spend another day resting, acclimatising, and organizing equipment into Yak loads at Chinese base. We then spend two days moving up to the "interim camp", which is located at 5,800 metres/19,000 feet, and halfway to the "advanced basecamp (ABC)". After resting and completing our training, we will begin our climb of Everest. Climbers approaching the North Col at 6800 metres/22,300 feet. Lines are fixed here for safety. Our tents at the North Col at 7000 metres, also known as camp 1. Climbers Walking up to the 7500 metre/24,600 feet, camp, also known as camp 2. You can see the tents in the North Col in the background (Ryan Waters). At the 7500 metre/24,600 feet, camp (Ken Stalter). On the way up to camp 3 at 8300 metres/27,200 feet, which lies up and to the right in the photo (Ryan Waters). Camp 3. Andre Bredenkamp and Chris Drummond in Camp 3 (Franck Pitula). After ABC, there is a steep ice and rock climb up to North Col (Camp 1) at 7000 metres/23,000 feet. This is a pass between the Everest North East Ridge and Changtse at 7600 metres/24,900 feet. To reach camp I, we ascend the glacier to the foot of the col where fixed ropes are used to reach the North Col at 7,000 metres/23,000 feet. From the North Col, we ascend the rocky north ridge to set up Camp 2 at around 7,500 metres/24,600 feet. The route goes up the north face through a series of gullies and steepens into down sloping slabby terrain before reaching the site of Camp 3 at 8,300 metres/27,200 feet. From Camp 3, we will make our final summit push. Climbers must first make their way through three rock bands known as the first, second, and third steps. The first step is only about 3 metres located at 8,500 metres/28,000 feet. The second step is located just above the first step at 8,500 metres/28,000 feet, and is about 50 metres/160 feet, high. The third and final step is slightly further up from the second at 8,800 metres/28,870 feet, and is about 20 metres/60 feet, high. The third and final step onto the summit. Ryan on the Summit. (Ryan Waters). Franck Pitula on the summit. A sunburned Felix back in ABC after summitting. We are very excited to be offering a traverse of Everest. There are two ways to do it, from Nepal to Tibet, and from Tibet to Nepal. We are able to offer both options as we have expeditions from both sides. If you are interested in doing this, please contact us as soon as possible. From the summit, you will cross over and ascend the other side of Mt. Everest where camps will already be established from our Nepal expedition. For more about the route coming down from the summit on the Nepal route, please click here. For more about the cost of doing the traverse from Tibet to Nepal, please click here. 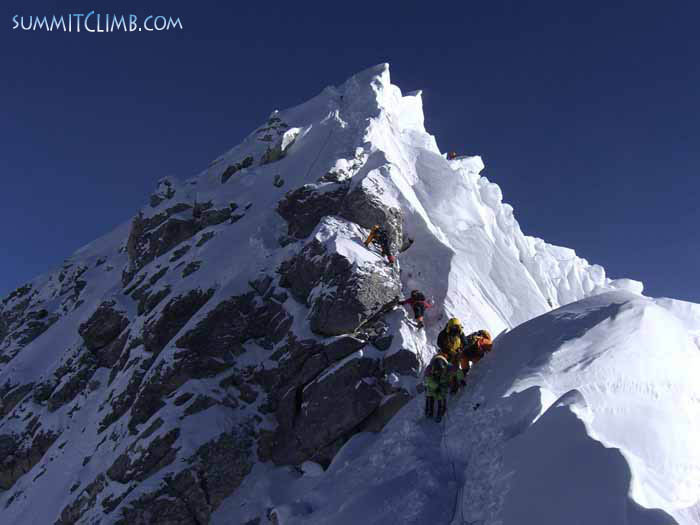 A view of the famous Hillary Step coming down from the summit on the Nepal side (Fabrice Imparato). Thank You for joining our Everest Tibet Expedition.